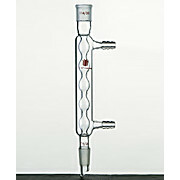 Coil style reflux condenser with tightly wrapped coil providing maximum cooling. 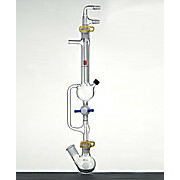 Excellent for use with volatile solvents. 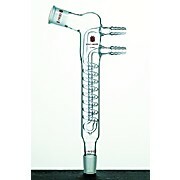 Condenser has a top outer standard taper joint and lower inner drip tip joint. 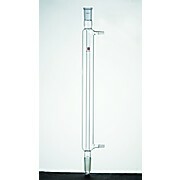 Allihn Condenser Jacket Length: 120, 200, 300 or 400mm available Joints: 14/20, 19/22 or 29/42 available Hose Connection OD: 8 or 10mm With outer joint at the top and inner joint at the bottom. West Condenser Joints: 14/20, 19/22, and 24/40 available Jacket Length: 110, 190, 200, and 300mm available Narrow annular space for fast collant speed thus high cooling efficiency. Jacket has an O.D. 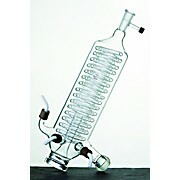 of 40mm while coil O.D. 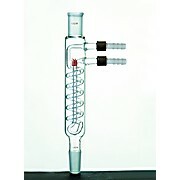 is 8mm to provide maximum cooling capacity. 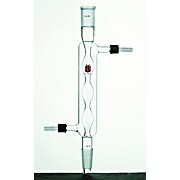 Dewar Condenser, Micro Joints: 14/20 Inside Depth: 90mm Inside Diameter: 31mm Side joint is at 90 degree angle. 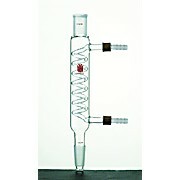 Double coil condenser for use with Buchi rotary evaporators for cooling with tap water in a diagonal position. A 19/38 top valve. With 35/20 spherical ball joint. Indentations at the bottom for supporting packing material. 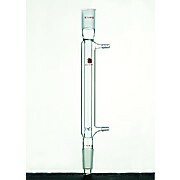 Jacket permits the column to be used as a condenser. 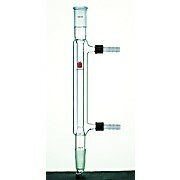 With a joint at 15° angle. 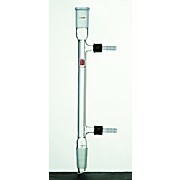 Supplied completely with Nylon® cap and hose connections. 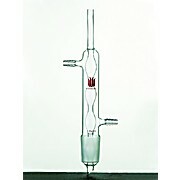 Allihn Reflux Condenser with a water cooled inner drip tip at the bottom for Soxhlet Extractors. 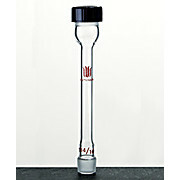 Joint Size: Available in 34/45, 45/50, and 55/50 Jacket Length: Available in 190, 260, and 300mm. 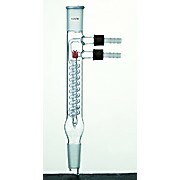 Vigreux Distilling Column, Microscale, Synthware, Joint: 14/10, Overall Length: 122mm, Length Indented Section: 75mm, supplied with one compression cap, one Viton O-ring and one PTFE-faced silicone septum. 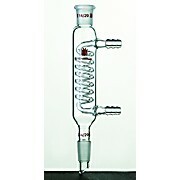 Coil Reflux Condensor, Microscale, Synthware, Joint: 14/10, for low boiling solvents, supplied with one compression cap, one Viton O-ring and one PTFE-faced silicone septum. Extended offset lower tip for drop control. 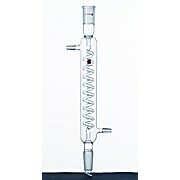 Coil style reflux condenser with tightly wrapped coil providing maximum cooling. 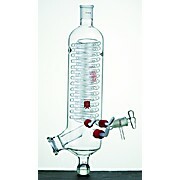 Excellent for use with volatile solvents. 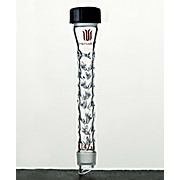 Condenser has a top outer standard taper joint and lower inner drip tip joint. Hose connections have an O.D. 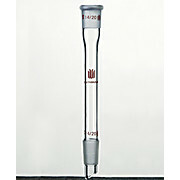 of 8mm or 10mm at the middle serration. 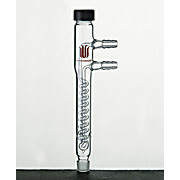 West Condenser, Removable Hose Connections Joints: 14/20 and 24/40 available Jacket Length: 110, 190, 200, and 300mm available Condensers feature narrow annular space for high coolant efficiency. 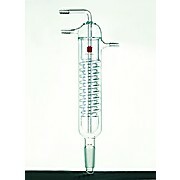 Reflux Solvent Still, Microscale, Synthware, Capacity: 25mL, Joints: 14/20, Stopcock Bore: 2mm. 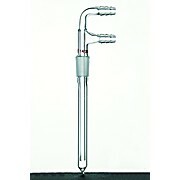 Allihn Condenser, Removable Hose Connections Jacket Length: 120, 200, 300 or 400mm Joints: 14/20, 24/40, or 29/42 Hose Connection OD: 8mm With outer joint at the top and inner joint at the bottom. 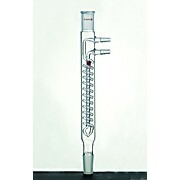 Liebig Condenser Jacket Length: 100, 120, 180, 200, 250, 300, 400, and 500mm Joints: 14/20, 19/22 and 24/40 available Hose Connection: 8 or 10mm With outer joint at the top and inner joint at the bottom. 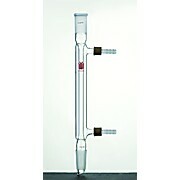 Liebig Condenser, Removable Hose Connections Jacket Length: 120, 180, 200, 250, 300, 400, and 500mm Joints: 14/20, 19/22, and 24/40 available Hose Connection OD: 8mm With outer joint at the top and inner joint at the bottom. 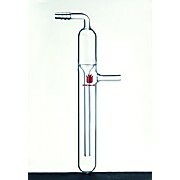 With small ball joints to prevent mineral oil being sucked back under sudden negative pressure in the system. 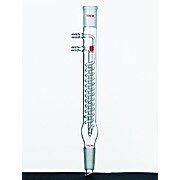 Air Reflux Condensor, Synthware, Joints: 14/20, Overall Length: 143mm, Length Between Joints: 96mm. 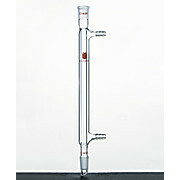 Top outer joint is angled 75 degrees to the condenser body. 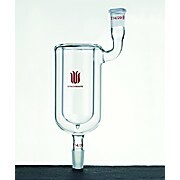 Coil section is 100mm in height. 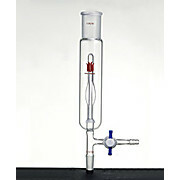 Air Reflux Condensor,Microscale, Synthware, Joint: 14/10, Effective Length: 100mm, supplied with one compression cap, one Viton O-ring and one PTFE-faced silicone septum.